You are currently browsing the category archive for the ‘Tomato’ category. I’ve been cruising along and enjoying the ride these last 6 months. I’ve browsed through many different blogs, appreciated some seriously good photography, experimented with new ingredients and cooked up a storm, more than ever before, in order to put tried and tested recipes in my blog and the other sites I contribute to. Having gone with the flow, I think I may want to navigate a little bit more purposefully. For sure I want to improve my photography skills and maybe even explore the history of food in different cultures. However for now I want to focus on one area in this blog. Developing recipes for children of all ages. A lot of people ask me for vegetarian ideas for kid’s school lunches that don’t involve 2 slices of bread and the usual suspects in between. So I thought it would be a great idea to do a monthly post on children’s breakfasts, lunches and snack ideas. Maybe some recipes that kids can cook along too with their parents? Maybe cooking ideas for kids in college dorms? Having posted a couple of times on the Meatless Monday site I thought it would be fun to do kid friendly recipe posts for this website so there can be options for parents who might be wanting to get their kids on board. Coz I don’t see Sammy answer to his mom’s call to “Come and eat your sprouted quinoa honey”! This post is also very special to me. My lifelong friend, who lives in India, recently asked me to give her suggestions for an Italian pasta dish she could cook in her ‘traditional Tamilian kitchen’. So S, this one is especially for you. Specialized ingredients are hard to find in India or would involve a trek to the only market in the city where it may or may not be available at all times. So this recipe is something that anybody, anywhere can make, the only two tricky ingredients could be celery and fresh basil leaves. 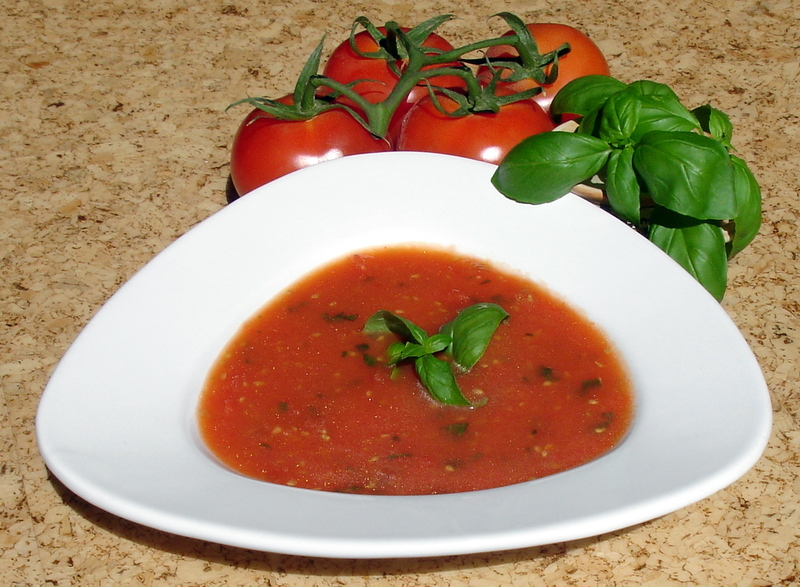 The celery can be left out and fresh basil could be substituted with dried basil, Italian herbs or dry packaged soup mix. 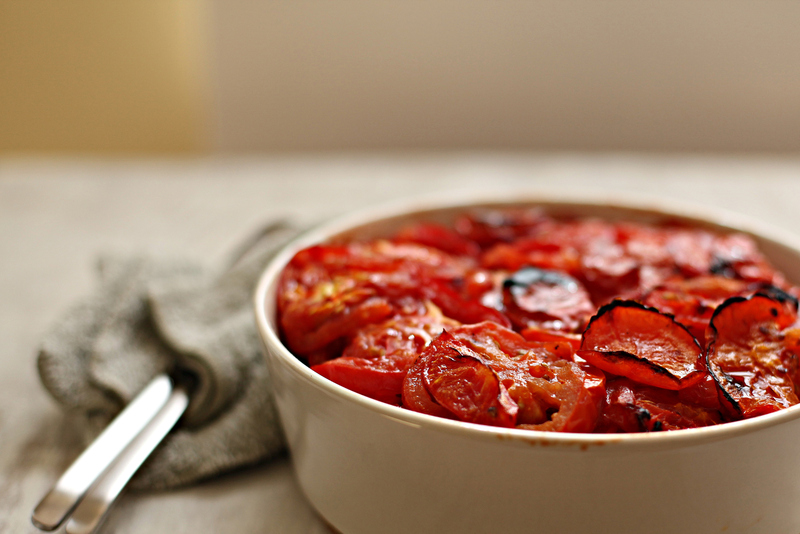 Take a wide enough pan to hold all the tomatoes in a single layer. 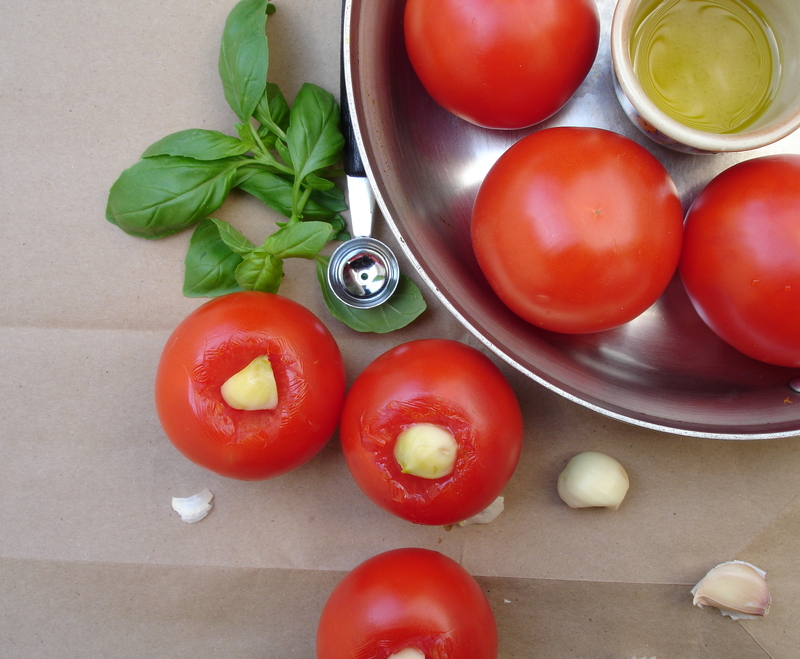 Scoop out the ‘eye’ of each tomato and insert the garlic cloves into the tomatoes through here. Start the pan on a low to medium heat and add a table spoon of oil. 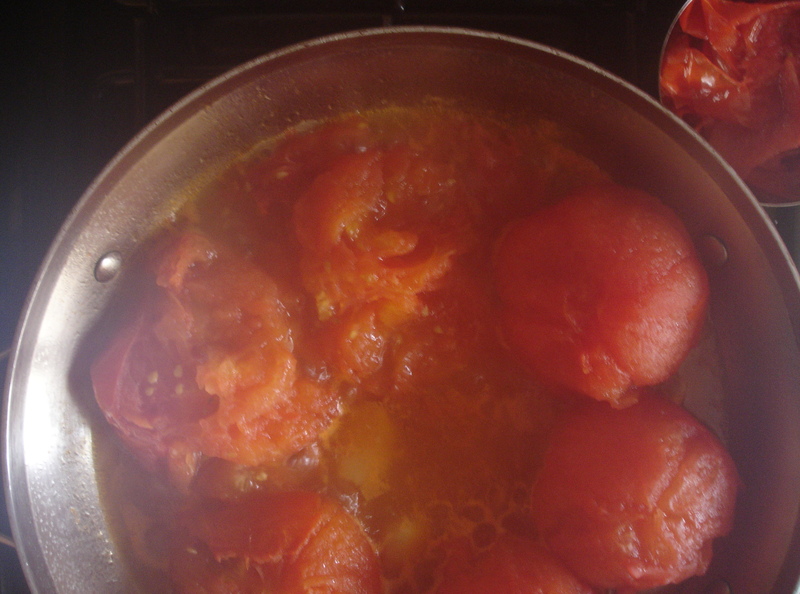 Then place the tomatoes scooped side down on the pan. 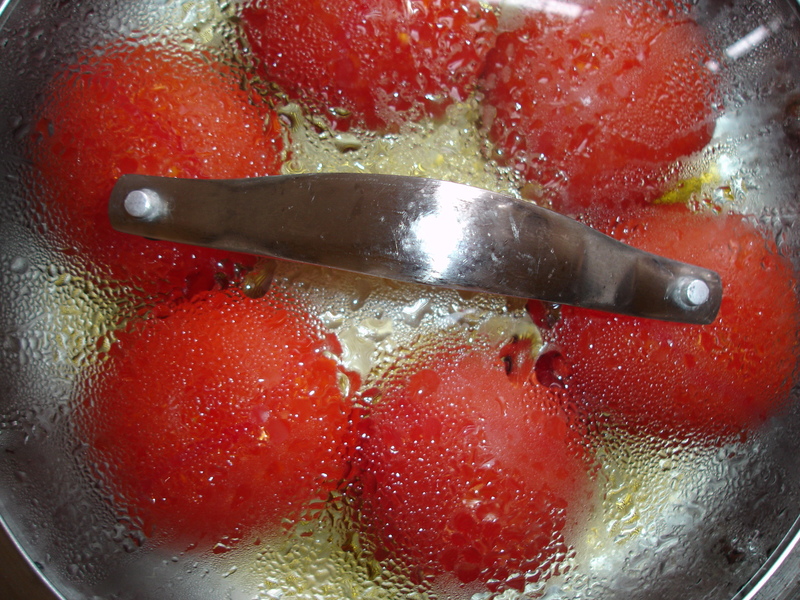 Push the cloves really deep into the tomato so it doesn’t burn on contact with the pan. Put a tight fitting lid on the pan and forget about it for the next 10-12 minutes. The tomatoes steam cook and the juices released ensures the tomatoes don’t burn as long as the heat is on low or medium. When you remove the lid after about 10 minutes you will see the tomato skin have split. If you want, you can pull the skin off very easily with a pair of tongs, or you can leave them on if you are going to puree the sauce completely. I remove the skins as I process it minimally. 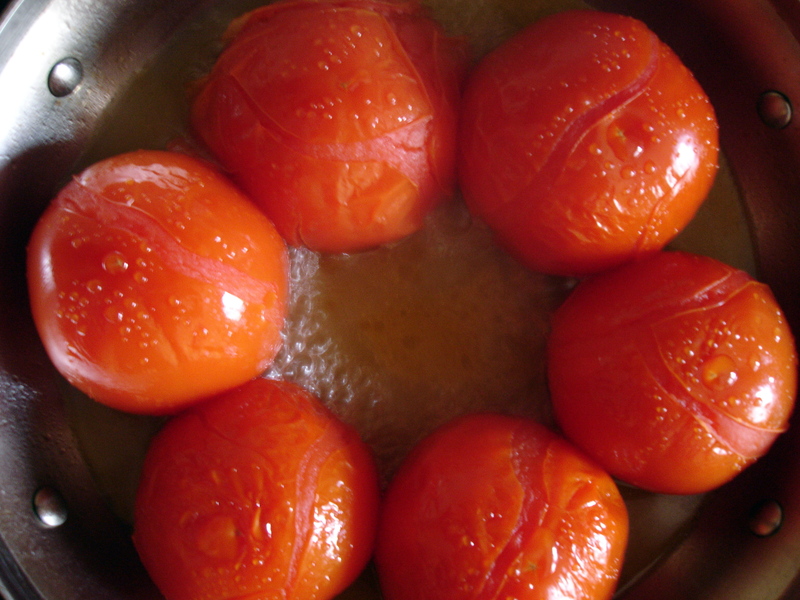 Now pick up each whole tomato and put them top side down on the pan for the other side to cook and put the lid back on. From this step on you might want to take over the cooking from over your child. 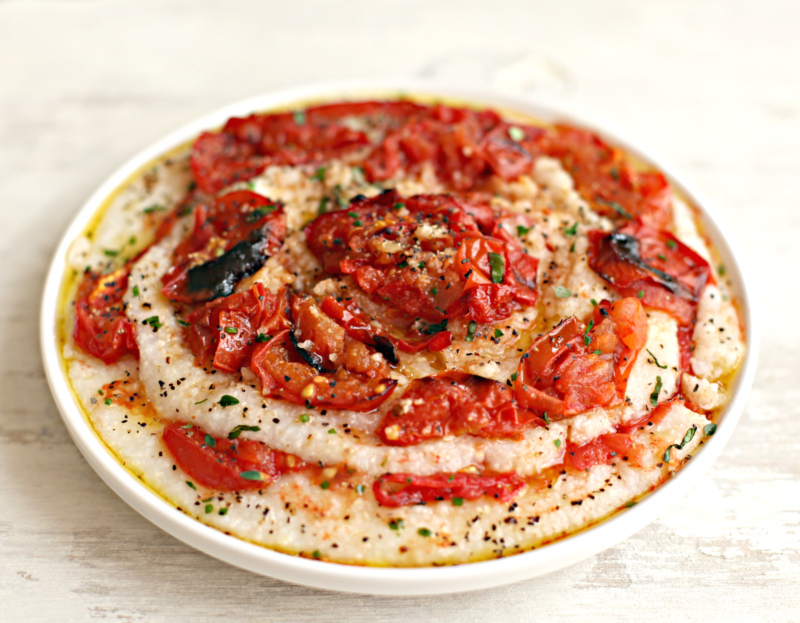 Give the tomatoes another 7-10 minutes on this side. Turn the stove off and mash the tomatoes carefully with a potato masher or use an immersion blender [which is what I use] to get the consistency you desire, chunky or smooth. Alternatively put the whole thing in a blender and puree. Then add the torn basil leaves, salt and pepper to taste and turn the stove on again and cook the sauce till it is bubbling. I remove all the garlic cloves before blending the soup as I prefer the sauce with just a mild garlic perfume. 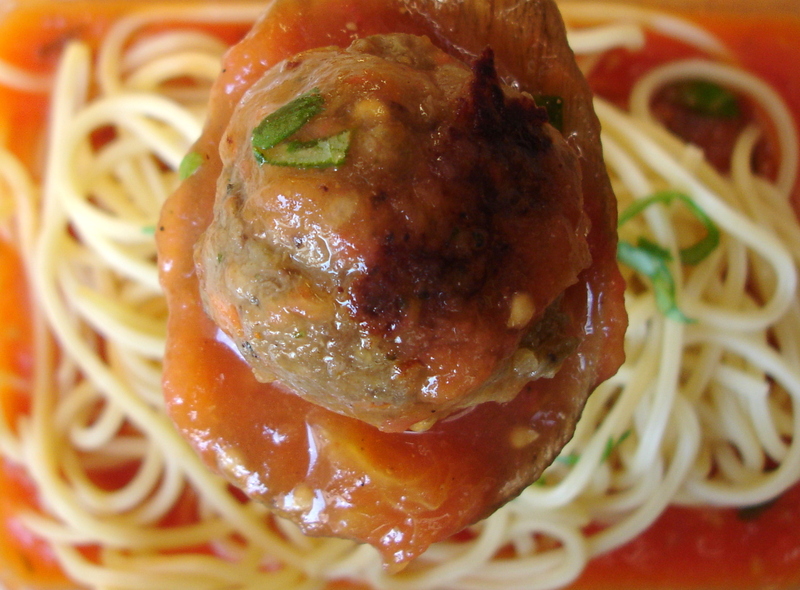 The garlic cloves can also be floated in the sauce, it will certainly make a pretty sight. Or remove the whole cloves from the sauce and use it to rub it on your grilled bread. 1/4 Cup boiled potatoes, mashed to a creamy consistency. Please see my earlier post here and follow all the steps with a few changes brought on by changing a few spices. 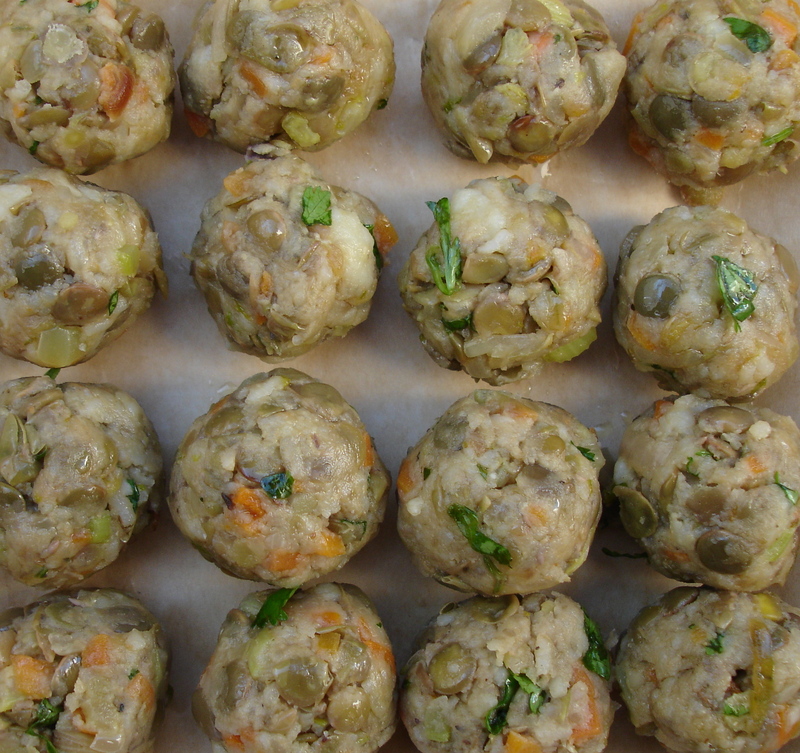 Instead of forming patties make about 12-16 balls. 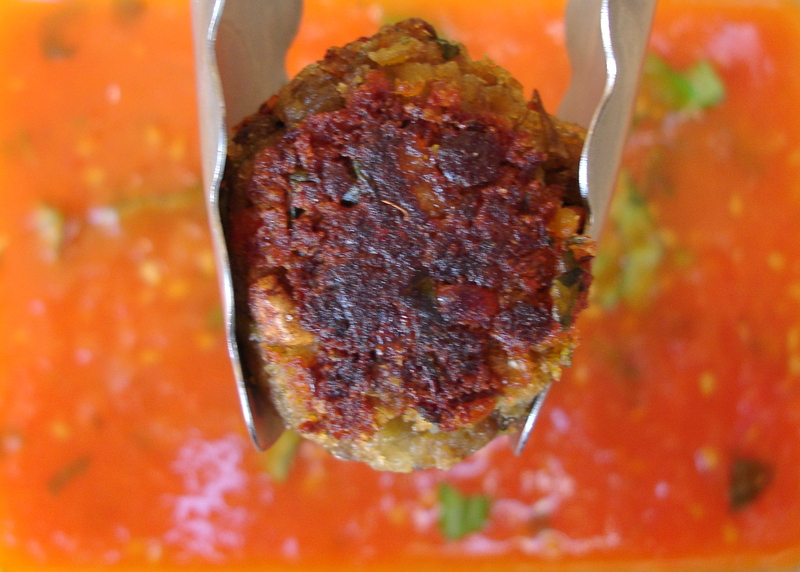 Shallow fry these meatless balls for a few minutes [about 7-10] till they are golden brown all over. Just remember not to move the balls in the pan until they are done and release easily on their own. Otherwise the balls will stick to the pan and the crispy exterior will not form. Now add the golden brown meatless balls to the bubbling sauce and let it cook for a few minutes and then turn the stove off. Garnish with basil if using and serve with spaghetti.